This is a collection of free Major League Soccer Logo icons representing each team in the MLS! Each icon has a soccer ball and the logo of the specific team. Show your team pride with these icons by using them on websites, forums, blogs, etc. If you use these icons, a link back to Sideline Soccer is appreciated. Get them now on our Stuff page! Do you use the Firefox browser? Firefox recently released a new feature called Personas, which are themes to dress up your browser’s look. 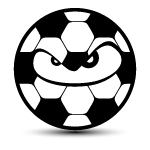 Now you can dress up your browser with a Sideline Soccer persona!